Mr. Fanatic took a week off of work and we spent it at the Mountain Cottage and started working on the first part of the renovations. A very strange thing happened there...I woke up early and went to bed early (I'm naturally a night owl and sleep until 8 or 9) and Mr. F stayed up later than usual and slept in late. Not sure what that means, but I found it odd. We were pretty busy all week, but took a few breaks out on the porch with the view of the mountains. The view from the cottage is ever changing, especially throughout the day. The trees were showing the first signs of Fall. Last weekend, more of the trees were turning gold and there were a few pops of red. We started on the two bedrooms. Both the downstairs and upstairs bedrooms were wallpapered in blue. The blue really made the rooms dark and the curtains didn't let much light in through the windows. Here's the view looking back at the door. I really love those bifold closet doors, but the room would look much better if they were a lighter color. We are going to make the closet space a foot deeper and create a half bath. Nothing like stumbling down the stairs in the middle of the night to use the one bathroom. We will put in a small closet to the left of the entrance door and put in some floor to ceiling shelving(behind doors) on the left side where the closet is now. We thought we were going to get lucky with removing the wallpaper, when it came off in sheets on the knee wall in the upstairs bedroom. We removed the wallpaper on a previous weekend, then patched the walls. It wasn't easy to remove at all. We spent the whole weekend removing the wallpaper in the two bedrooms. We scored the wallpaper and spraying it with a warm solution we purchased specifically for this purpose. I have to confess I was thinking VERY bad thoughts as I was removing little strips of paper from the walls. After we finished removing the wallpaper and patching, I was on Instagram and saw that HomeRight had a steam machine that not only cleans, but removes wallpaper. Right then and there, I sent HomeRight a message about our Mountain Cottage reno. They said they would send me a steam machine so I could review it when we remove the wallpaper in the Kitchen and bathroom. We will also be using it to clean the other rooms without wallpaper. I was so happy the day it arrived! Can't wait to try it out. Since there was a sticky orange residue on everything in the house (that I believe was nicotine) and because we think the trim paint was oil based, we painted all of the surfaces with Zinsser oil based Cover Stain. Wow, I had forgotten how strong the oil based Zinsser smelled. Guess I should back up a bit and let you know that after removing the wallpaper, we washed all of the surfaces that hadn't been covered by wallpaper. We used a 50/50 solution of white vinegar and water. From our findings on the internet, some recommend either a bleach solution or ammonia solution to remove nicotine residue (never put bleach and amonia together~ these were separate solutions). The closet walls in the downstairs bedroom had orange spots halfway up the wall and the vinegar solution took it right off. A coat of Zinsser Cover Stain was applied after washing and rinsing the trim and ceiling. 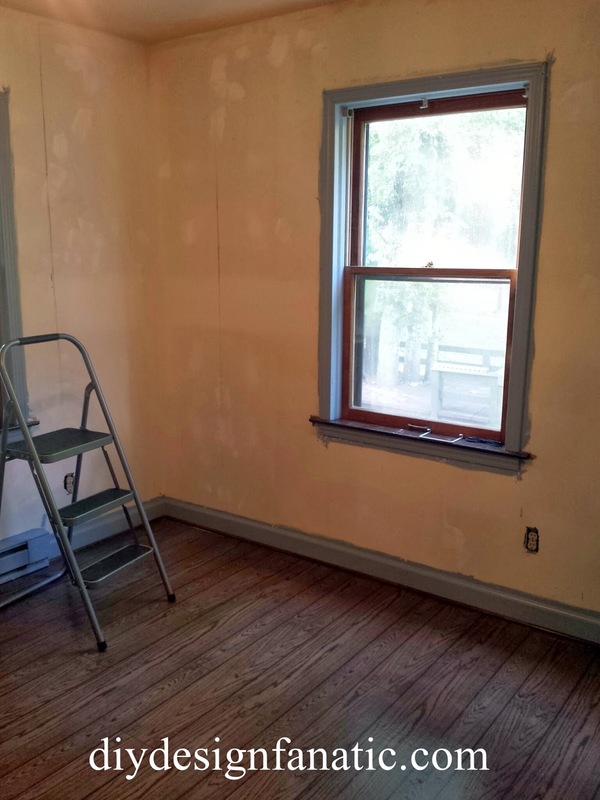 Once we were finished with the Zinsser, we couldn't wait to get the paint on the walls. 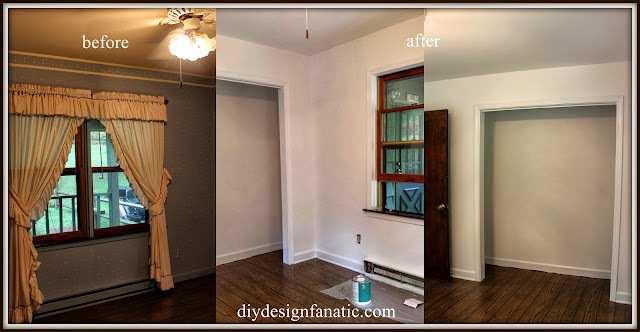 When we went to the paint store, we saw Benjamin Moores brochure for their paint colors for 2014 and thought that A Breath Of Fresh Air would brighten up the downstairs bedroom. 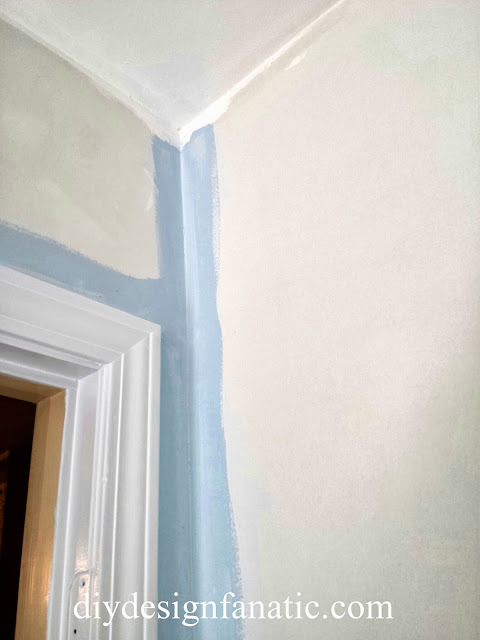 After painting the ceiling and letting it dry, I started to cut in, A Breath Of Fresh Air kinda looked like the color of the wallpaper we had just taken off. We took a little detour and found this picturesque farm...I'm going to have to go back some time and bring my good camera with me. This photo was taken with my cell phone. 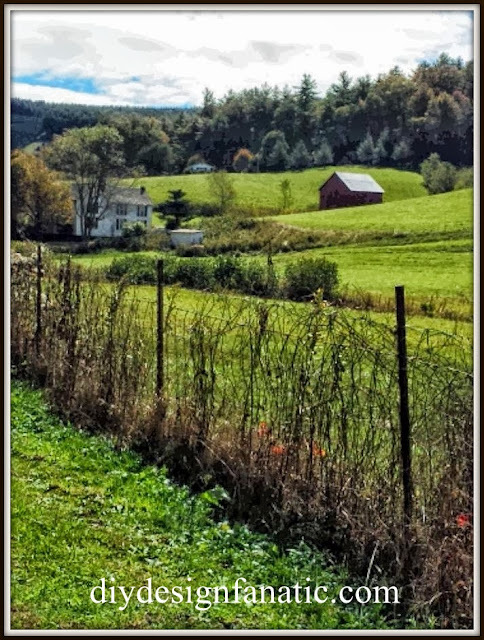 Wouldn't you just love to live in that white farmhouse with the red barn on the hill? Here's the downstairs bedroom painted white. The room is soooo much brighter now. Here's the other side of the downstairs bedroom after one coat of Benjamin Moore Decorator White in eggshell on the walls and 2 coats of Decorator white in semigloss on the trim. Ahhh, so much brighter and better. We are planning for Mr. Fanatic to build in a custom closet system. Can't wait. It will be so nice to hang up my clothes in the closet. 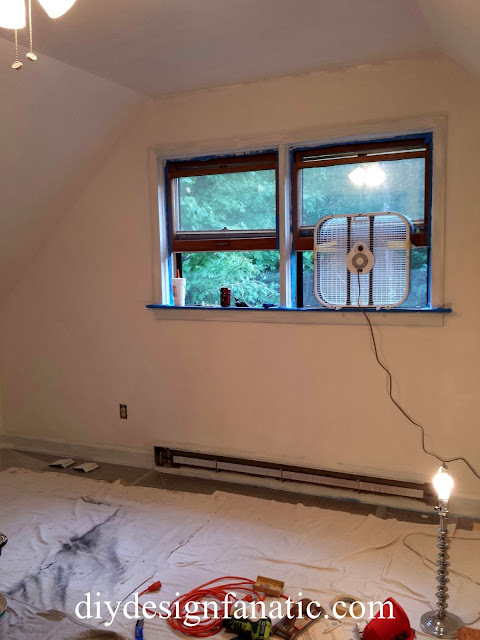 In the upstairs bedroom, we decided to paint the top part of the ceiling and the angled part of the ceiling with the ceiling paint. It was the house brand that we purchased at Boone Paint and Interiors. We are extremely happy with the coverage and I believe it was only $17 a gallon. 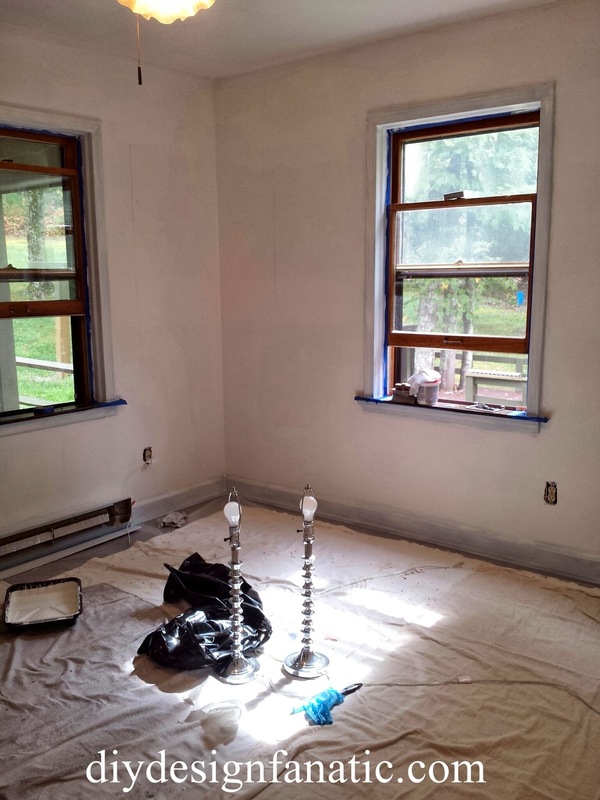 The walls are painted with Benjamin Moore Balboa Mist. So much better than the blue wallpaper, don't you think? Did you notice that Mr. F replaced all the outlets? Both bedrooms now seem so fresh and clean! It's amazing what a couple of coats of paint will do. Can't wait to get started decorating the downstairs bedroom. The upstairs bedroom will have to wait until the bathroom is finished. I'll leave you with a common scene at our Mountain Cottage. Three deer came by a couple of times a day. 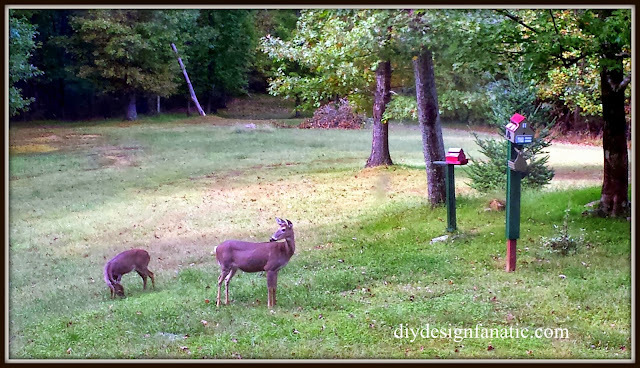 One day a 4th deer came by, but momma chased her off. Every time they'd show up, one of us would holler to the other "the ladies are back". Once day we came downstairs and saw 7 wild turkey in the yard. Hope you'll stop by tomorrow to hear about some other projects we accomplished while we were at the Mountain Cottage for a week. Wow Pam- you guys have gotten a lot done! I had a bad feeling about that wallpaper- I hope that steamer works great! The bedroom does look larger and feels less busy. Isn't it great to have nature visiting you! I am fortunate to get that here at my home. I get turkey's regularly and I never get bored ot it. Wow, Pam what a difference. I hate removing wallpaper, too. Can't wait to hear how the machine works. Lucky you to enjoy that mountain view and air. It is looking good Pam! Can not wait to see it all decorated. Pam...It's been awhile since I came by, sorry! 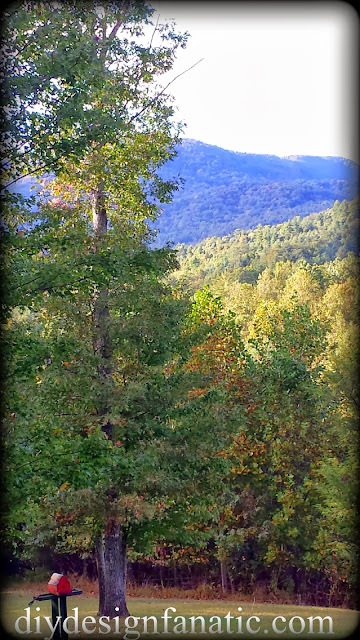 I think it's so neat that you bought a mountain home, is it in NC? You and hubby are making some serious progress and I agree, paint can perform miracles. I hope the steamer works. 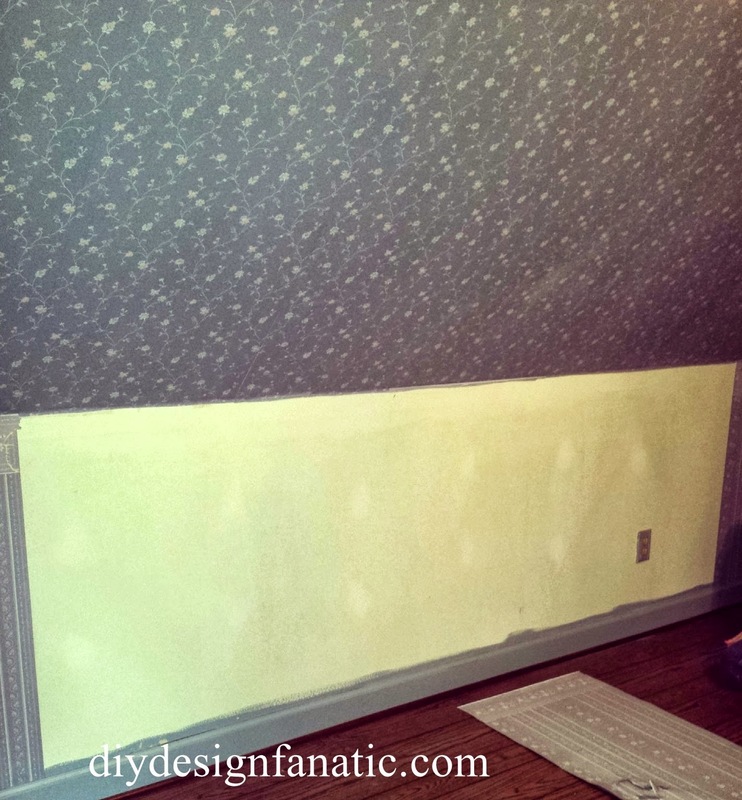 When we moved in our house one room had four layers of wallpaper! Pam, when you said you were going to your Mountain Cottage, I thought you were going to rest and relax.... then in the same sentence you said you were going to work on renovations. WHAT? I really hate stripping wallpaper too! Your rooms look wonderful! It must feel great to get that stripping and cleaning and painting behind you. Lucky you to have such a delightful and peaceful place to retreat to! Pam, this is so exciting seeing your changes that you've made. Everything is looking fresh and bright. 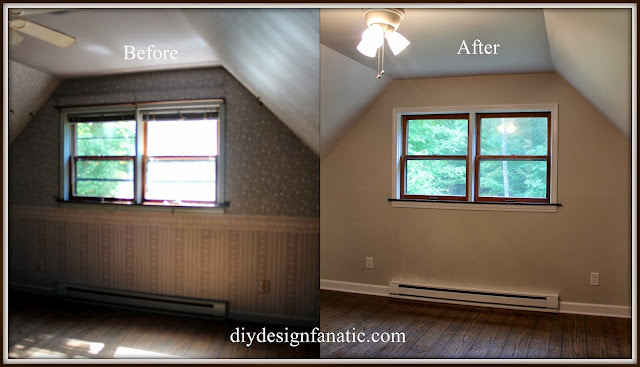 How great that you now have that steam machine to remove the remaining wallpaper! Big sigh Pam. Your views are amazing! I really like what you are doing with the cottage. So amazing what a coat of paint does!